Body Brushing – Increase Circulation and Help to Reduce Cellulite - Amphora Aromatics Ltd – Supplier of pure essential oils and aromatherapy Products. Hi everyone – Sophie here again with my latest blog. I am going to be going into more detail about how useful our Wooden Cellulite Brushes and our Body/Brush Massagers can be in skincare. Click to discover more. Cellulite can be a terribly debilitating problem that can have a really negative impact on body confidence and consequently can affect other areas of our life too. As I’m sure you’re aware, the skin appears lumpy & dimpled especially around the thighs, hips, buttocks and abdomen. It’s most common in women, affecting nearly 90% at some point during their lives. The best way to rid your body of cellulite is regular exercise, a healthy diet and lots of water. As your muscles become firmer and more toned your skin will become tighter and less susceptible to cellulite. 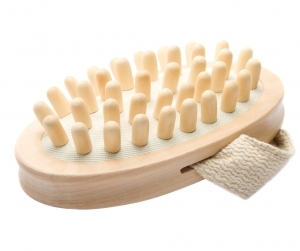 This handy wooden brush slips over the palm of the hand to enable easy massage over areas of cellulite. The stiff wooden nodules work like strong fingers to gently but firmly massage the skin, helping to stimulate circulation and tone the skin. This wooden brush is a great 2 in1 brush. One side has soft natural bristles, perfect for dry body brushing (see my previous blog). The other has large wooden nodules like our wooden cellulite brush - great for massaging this skin helping to tackle cellulite. Use sweeping, circular motions to gently massage the affected area. This will encourage lymphatic drainage helping to remove toxins and break up the fatty deposits that can result in cellulite. When using your brush it is important to work towards the heart as this will help with the removal of toxins. For best results, use with a massage oil or lotion that will also help target the appearance of cellulite. Amphora’s Anti-Cellulite range is a great choice. It contains toning and firming essential oils including Geranium, Juniper, Cypress and Fennel. Simply apply the oil to the affected area and massage with the wooden cellulite brush as described above. The Anti-Cellulite blend is also available as a bath oil and a body lotion. The brush can be used all over the body or you can concentrate on particular areas of concern. The cellulite brush can also be a great choice for use after sports as it will help to stimulate the muscles and reduce the lactic acid build up which may cause cramps. Any anti-cellulite treatment will only have a chance of working when incorporated in to a well planned & healthy dietary and exercise regime. It is important to remember that body brushing or using Anti-Cellulite massage oils or creams alone is highly unlikely to get rid of cellulite. In the meantime, please check out my other blogs here and don’t forget my colleagues also blog regularly – you can see their posts here.